The Keys-wide sale of 65 commercial properties in the first half of 2018 is a 16% increase from the 56 sold during the first half of 2017 and surpasses the previous half-year record high of 59 that occurred in 2006 with the low, 13, in 2009. The $772K Average Sale Price (ASP) represents a -12% decrease from $877K for the same period last year. Keys-wide, the highest ASP for the first half of a year, $2.38M, occurred in 2005, and the lowest, $638K, in 2010. The Dollar Value of Sales increased 2% to $50M compared to $49M for 2017. Over the past 17.5 years, the highest DVS during the first half of the year was $124M in 2005. The lowest, $12M, occurred in 2009. The Sale Price-to-Original List Price (SP/OLP) showed a decrease of -4% at 85.19% from 88.65%a year earlier. (The SP/OLP compares the sale price of the property to the list price of the property at the time it first came on the market versus the list price at the time the contract was written and provides a measure of the mismatch between many sellers’ initial list price and the market price acceptable to buyers.) The highest, 98.03%, occurred in 2000 with the lowest, 58.78%, in 2007. The Sale Price-to-Final List Price (SP/FLP) of 87.38% is a -4% decrease from 91.19% in 2017. (The SP/FLP compares the sale price of theproperty to the list price of the property at the time the contract was written instead of the time the property was first listed and reflects the average percentage of the final listed price that buyers are paying for properties that have sold.) The highest, 98.09%, occurred in 2014 with the lowest, 81.43%, in 2009. Listed Properties increased by 53% going from 123 at the end of June last year to 188 on that date this year. · Highest increase in Listed Properties, 80% to 36 from 20. · Highest increase in Number of Sales, 167% to 8 from 3. · Largest decrease in In Sale Price-to-Original List Price, -11% to 80.40% compared to 90.69%. · Largest decrease in Sale Price-to-Final List Price, -16% to 83.38% compared to 99.57%. · Largest decrease in Days on Market, -38% to 223 days from 361. · Largest decrease in Months of Inventory, -68% to 26 from 80 due to the growth in Sold Properties with fewer Listed Properties. · Largest decrease in Average Sale Price, -75% to $630K from $2.4M. · Largest decrease in Dollar Volume of Sales, -59% to $6.3M from $15.2M. · Highest increase in Average Sales Price, 39% to $846K from $609K. · Only Market with increased Days On the Market, 4% to 232 from 224. · Highest increase in Number of Listed Properties, 210% to 90 from 29. · Largest decrease in Average List Price, -60% to $1.2M versus $3.1M. · Only Market to have fewer Pending Transactions, -22% with 7 versus 9. The significant increase in number of sales during the first half of this year is offset by the decrease in average sale price and the increase in number of listings. What this means for the average seller is that while there is more activity, it will take longer to sell , on average, going forward which is reflected in the months of inventory. The average seller will receive -13% less than their asking price and the sales and marketing process will take almost 8 months which is about twice as long as the overall market. The accompanying chart lists each of the 65 commercial transactions that occurred in the first six months of 2018 with detail and descriptions of each. These sales are grouped by area and include the address, the alternate key number (to allow you to search the Property Appraiser’s website for more detail), the sale date, sale price, building or lot sq. footage, $/sq. ft. sale price and a description of what was sold. 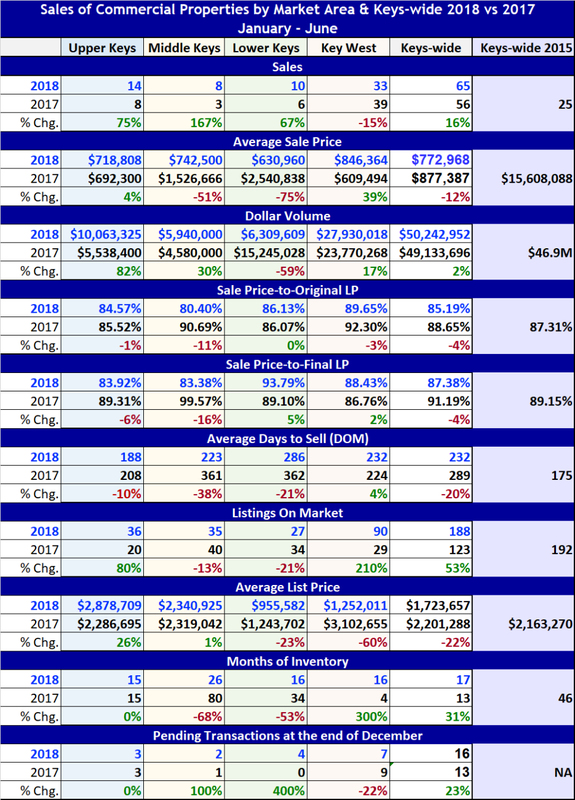 Each area lists the average sale price, square footage and $/sq ft sale price with an overall Keys-wide average at the bottom of the page. The value of commercial property is greatly affected by location, zoning and size. Properties located on US-1 with retail and restaurant use will typically be more valuable than warehouse or office space off of US-1. Waterfront properties typically have greater value than non-waterfront properties when the waterfront is useable. Development and redevelopment of commercial properties is regulated by zoning, land use and the nonresidential rate of growth ordinance or N-ROGO, otherwise known as N-BPAS or Non-Residential Building Permits Allocation System. Allocations of building rights for commercial square footage are given out by local government in an established ratio with residential ROGO or BPAS. 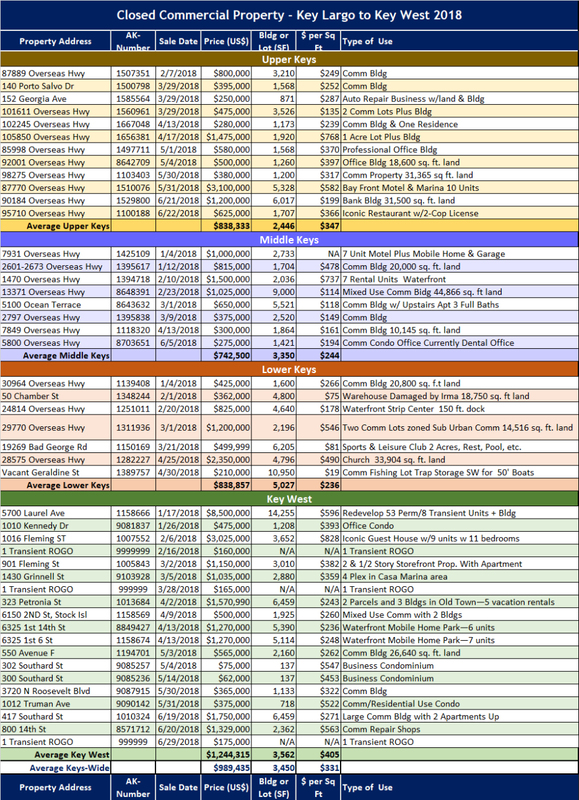 Unincorporated Monroe County and the cities award allocations for commercial square footage of new buildings based on their Comprehensive Plan and Land Development Regulations (LDRs). Existing commercial square footage can be redeveloped onsite within setbacks and building height restrictions. Additional building square footage can be added based on density, which is a function of the intensity of use, and which can be determined by the Density and Intensities Tables in the LDRs. All of the various political jurisdictions in the Keys have available commercial square footage to allocate and competition for awards through N-ROGO and N-BPAS is not nearly as competitive as for market rate residential units. Entitlements for transient residential units which are defined as campground spaces, RV spaces and hotel rooms that are available for nightly rentals, have not been available (with the exception of 100 transients given to the City of Marathon about 10 years ago) through ROGO or BPAS since 1986. Therefore, the number of transient units today is essentially the same as it was over 30 years ago. Transient units can be sold and transferred from one site to another. In the City of Key West, there were three (3) sales of transient ROGOs allowing for construction of three (3) transient units ranging in price from $160,000 to $175,000. The most recent sales of Transient Buildings Rights in Marathon (known there as TRUs) has been $80,000. Monroe County has had a moratorium on the transfer of all building rights, therefore, there have been no recent sales to report. ROGO, N-ROGO and N-BPAS as we know it today all end in 2023 at which time it is generally agreed that we will have exceeded the 24-hour evacuation time established by State Statute, which is the basis and limiting metric for ROGO and BPAS. As we get closer to 2023, we believe the values of existing developed Commercial and Residential properties will rise given the uncertainty of any more or a severe reduction in the number of building permits for new construction after 2023. Key Largo (877) 289-0035 100430 Overseas Hwy. Islamorada (800) 207-4160 85996 Overseas Hwy. Marathon (800) 366-5181 11050 Overseas Hwy.